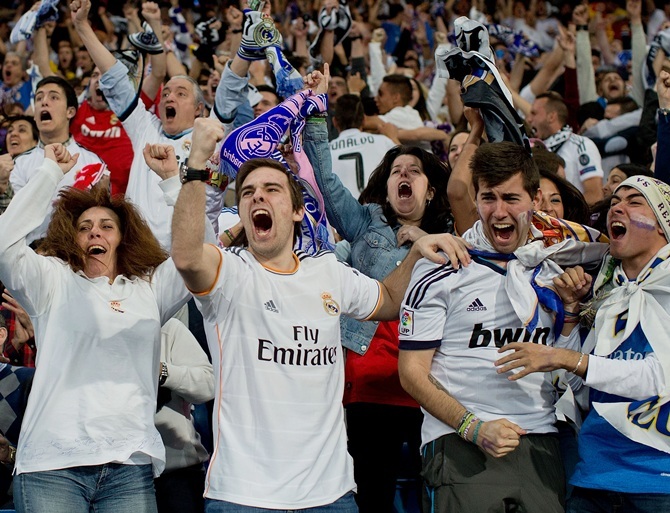 Whoever won, Madrid was never going to miss out on a night of celebrations. 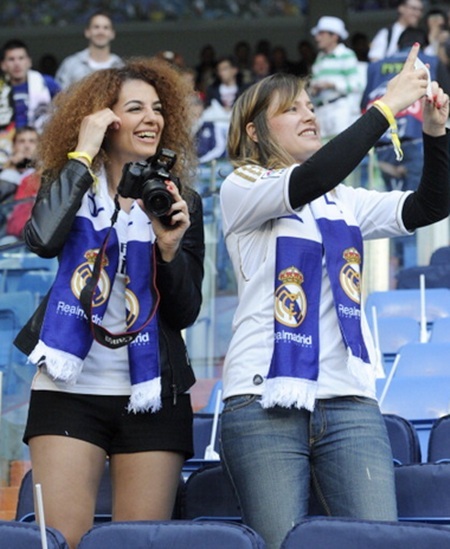 Thousands of Real Madrid fans, chanting ‘champions!’ and clad in their team's white colours, swarmed onto the streets of the Spanish capital on Saturday minutes after their team beat cross-town rivals Atletico Madrid in the final of Europe's elite club competition in Lisbon. Euphoric fans, who at one point in the game had thought Real's record-extending 10th Champions League victory was slipping away, flocked to the Cibeles fountain, a central landmark where the team traditionally mark their successes - less than 1km away from Atletico's usual celebration spot. "We're going to stay until the players get here," said Jose, a 47-year-old consultant wearing an oversized Real hat, who had squeezed into a nearby tapas restaurant to watch the game and was heading to the party. The Real team was expected to arrive back with the trophy from 1200 GMT onwards. 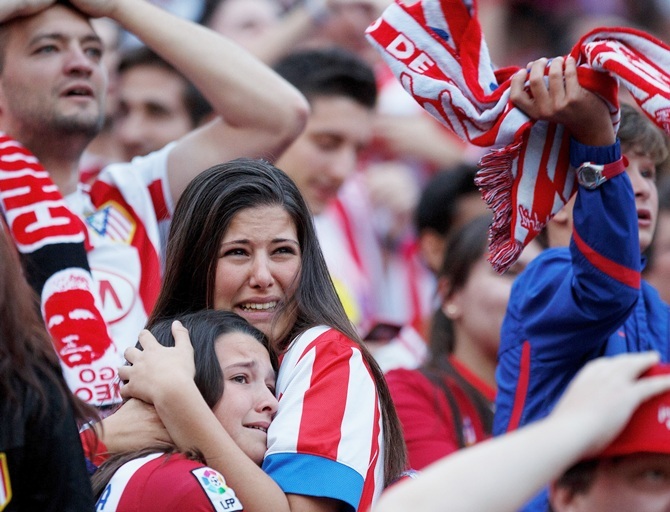 For supporters of Atletico, the 4-1 defeat in the first Champions League final to ever feature two clubs from the same city was especially hard to stomach..
After celebrating the Spanish league title in the streets of the capital only a week ago, the team were denied what would have been their first ever European Cup by their arch-rivals and wealthier neighbours in heart-breaking fashion. Atletico were on the verge of victory before a goal in the third minute of stoppage time by Real's Sergio Ramos made it 1-1 to take the final into extra time. "We were massacred, after being so close to winning," said Camino Lopez, a 57-year-old administrator and Atletico fan, after watching the game with friends in a pizza parlour in the traditional Madrid neighbourhood of Lavapies. 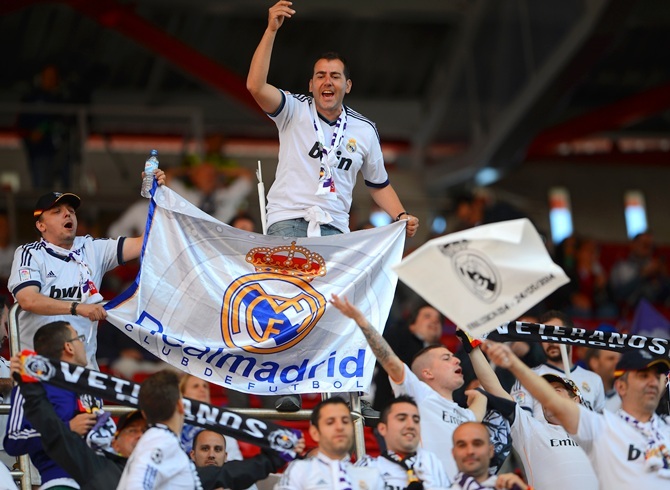 Despite the heartache for Atletico fans, who will now have to endure a night of loud partying by Real supporters who have not celebrated a Champions League win in 12 years, much of the teasing between the two sides remained good-natured. Fans mingled in bars - and some Real supporters even showed some sympathy for the beaten underdogs. "It was an excessive beating...Atletico deserved a better result," said lifelong Real fan and businessman Manuel Burgos, who watched the final in the same pizza restaurant. 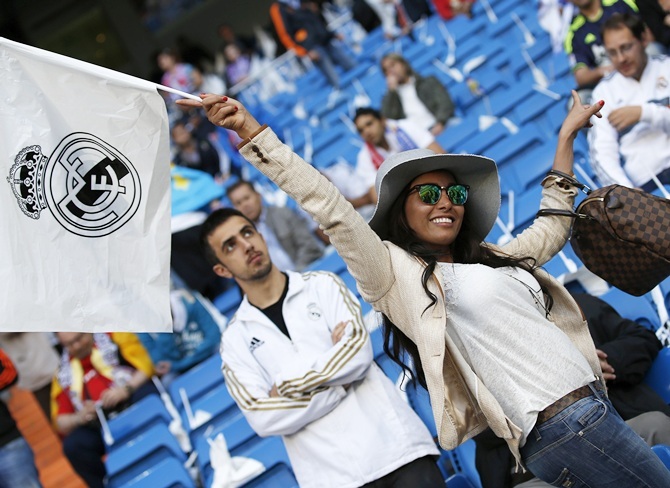 Police were erecting barricades in the early hours of Sunday in the central Madrid avenue around the neo-classical Cibeles fountain, to channel the growing crowds and eventually make way for the team's parade. A stage was already blaring music and more supporters were dancing their way to the party through the jammed streets. "I'm so happy to have beaten Atletico Madrid, to come back after 1-0," said Joaquin, a 27-year old fan dressed in his club's kit. "Atletico was a good rival... but it's Real, forever!"